Georgia, runs the jet sweep back to the left here with De’Andre Swift. They fake the run up inside with Sony Michel, but this is a very similar look to what Riley likes to do with Jordan Smallwood. 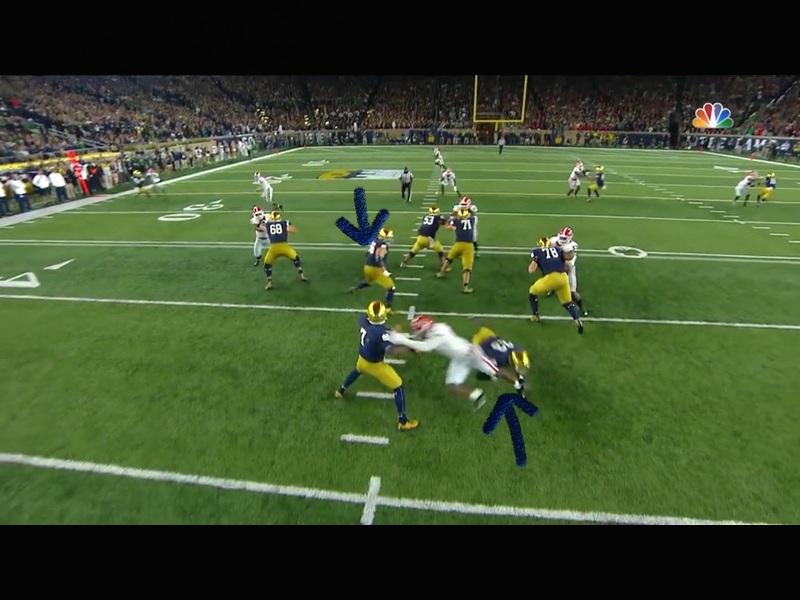 The two inside linebackers are sucked in with the fake to Michel, while the defensive end is too far down inside to make a play. There’s a lot of green grass right up through the ND logo at midfield for Swift to get into. 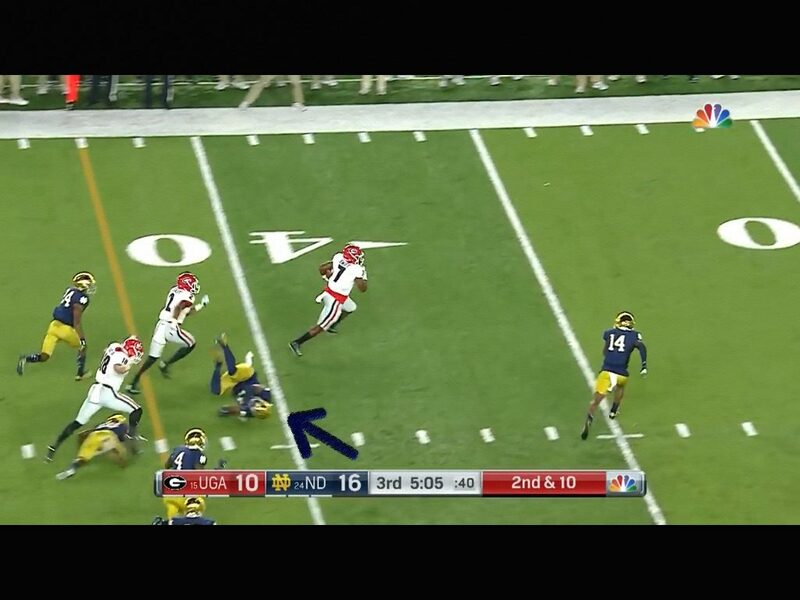 This run in a nutshell is what makes the Georgia backs so dangerous. 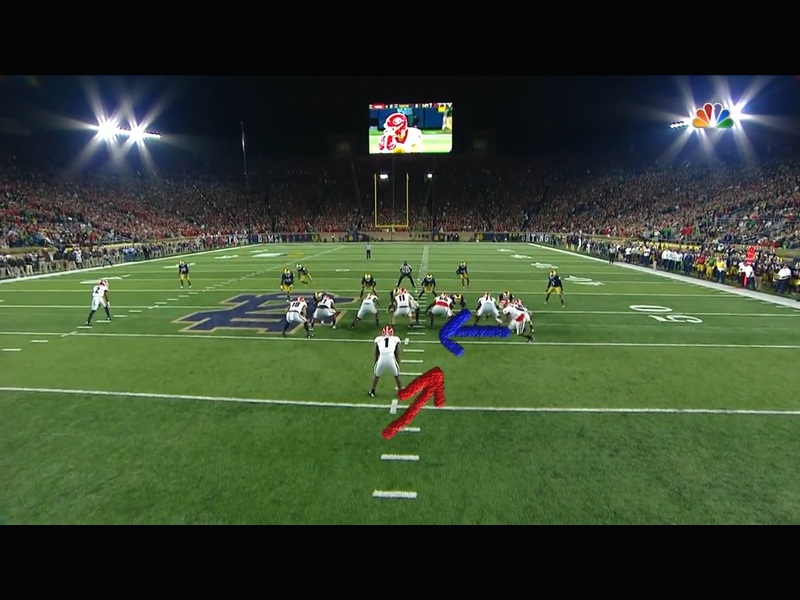 Most backs stay vertical here and try to outrun the defensive backs going straight ahead. Swift does a stop start spin move on the Irish defender that would make any streetball player proud. He outchea’ breakin ankles. How he made the trail player who was directly behind him in the last play and the guy who’s now on his back both miss is a tough thing to do. He made it look easy and was off to the races down the stripe. This is just a really well blocked play. 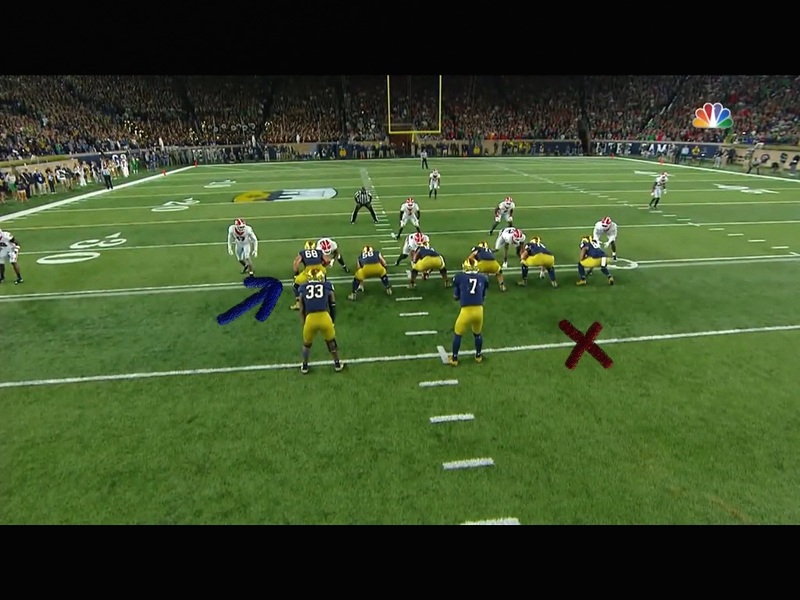 Right inside the tip of the blue arrow, Georgia OL, Kendall Baker #65 gets him a pancake, and the center is able to wall off the linebacker. 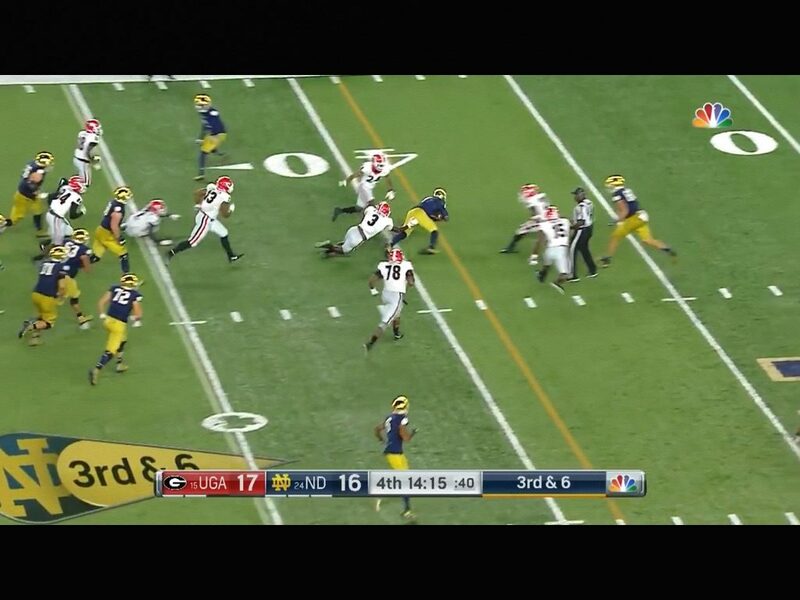 The three unblocked backside defenders can’t get through the trash and Michel walks in for the score. This is a cerebral bust by Wimbush. He has to know the protection and know what his guys are doing. He should have done one of two things. 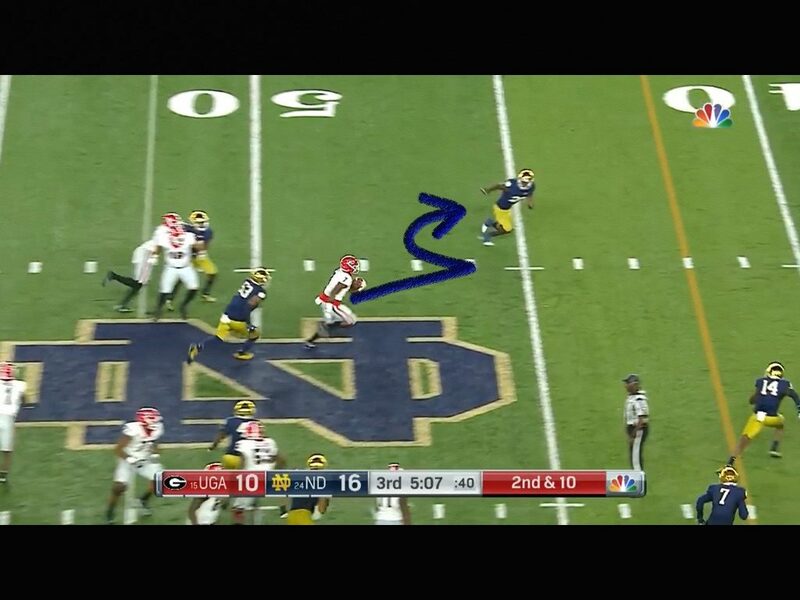 Slid the protection to the right, or moved his running back over to the red X. If you look at the left tackle, he’s looking for the linebacker to blitz on the left. The tackle on the right has the defender head up on him and can’t fan out to the other linebacker unless you slide the line all the way to the right. 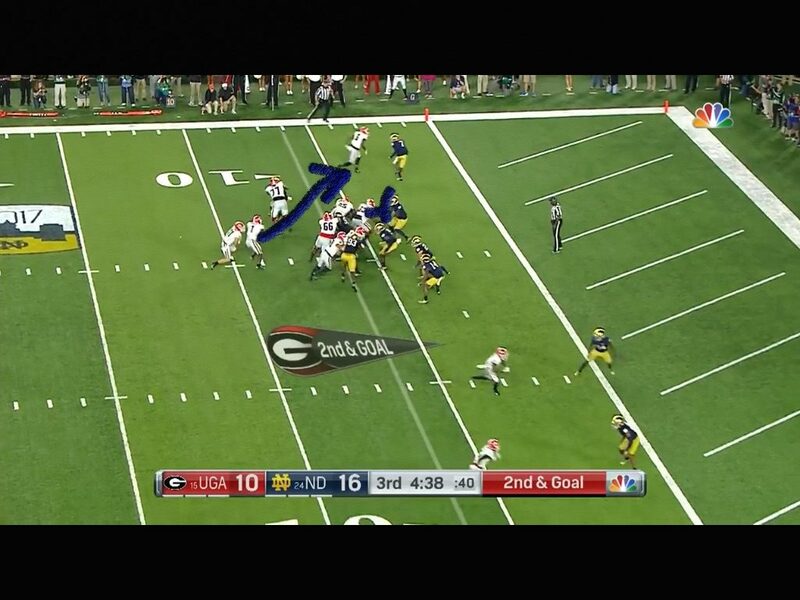 So here, the left guard and running back are both “looking for work” while Lorenzo Carter goes untouched. If A. you slide the protection right, or b move your back over, this sack doesn’t happen. The guard is still looking for work by the time Adams realizes that he needs to get over there. It’s a strip sack on a good drive that would likely have yielded points had they not turned the ball over. The protection needs to be spot on because the Bulldogs create a lot of turnovers. 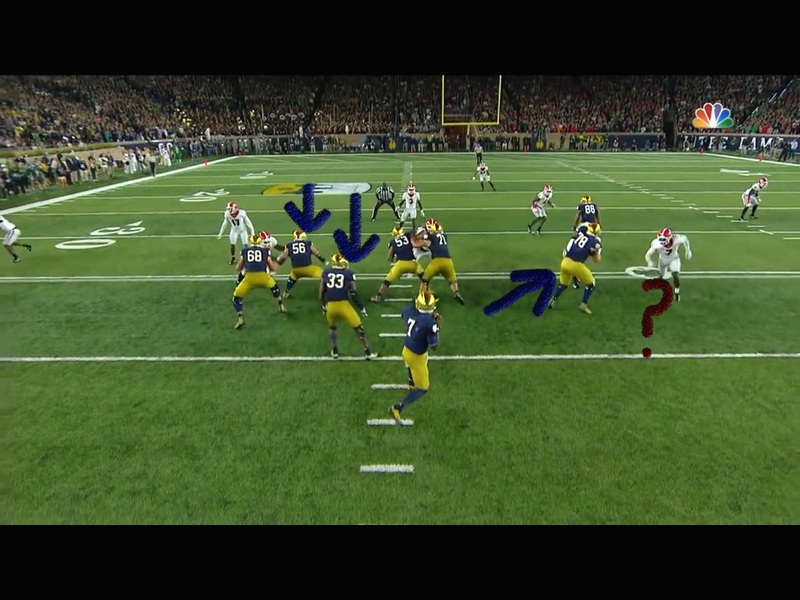 On this designed QB draw, Wimbush gets up into a nice crease. We may see a little bit of qb run game, but I hope we don’t. I keep thinking about how Texas had Alabama on the ropes before Colt McCoy got hurt in the National Championship game in 2009. Keeping Baker healthy is paramount. 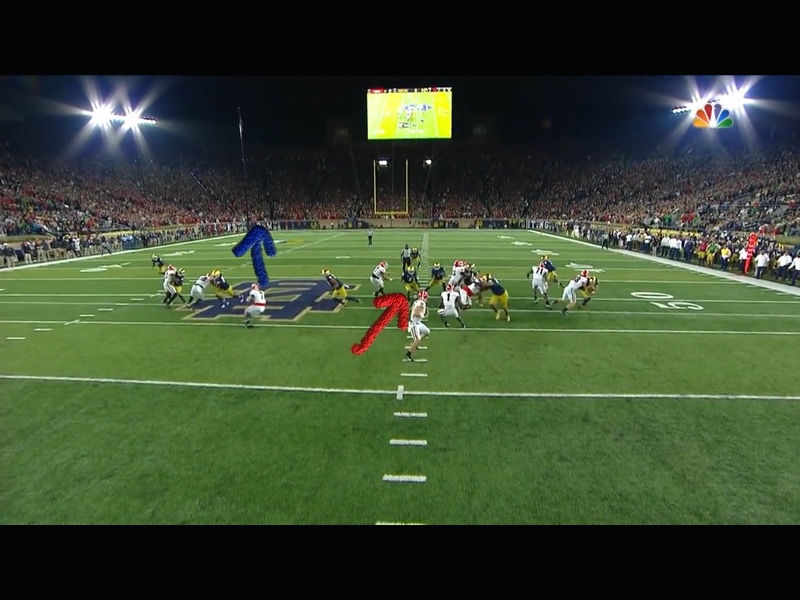 Wimbush hits the circle button and gets up past the first down marker. From a mobility standpoint I think Baker is every bit the equal of the Irish QB, but far superior with passing ability. This is great protection by the Irish OL. Georgia sacked the ND QB 3 times and had a total of 9 Tackles for loss in the game. They are very good at creating negative plays. Still though, I don’t see an elite pass rusher, at least not in this game so far. 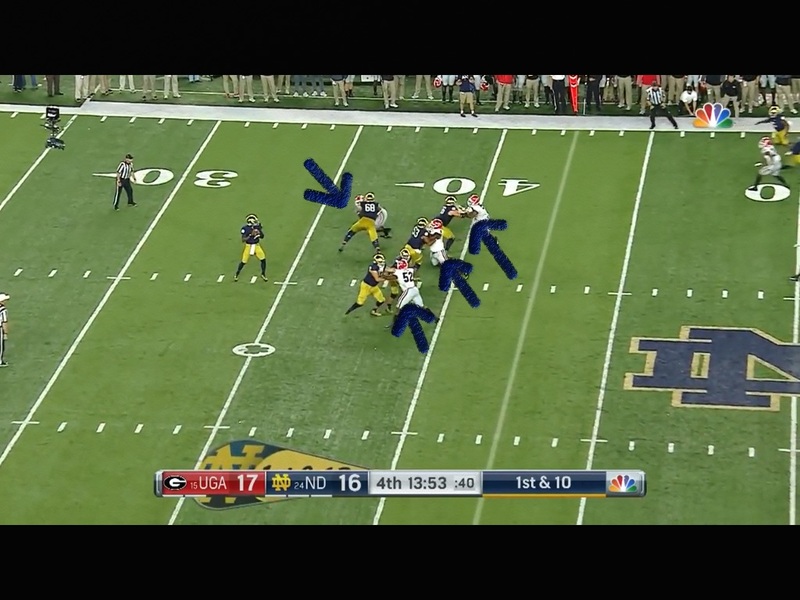 They don’t blitz a whole lot, rather preferring to drop more players in coverage. 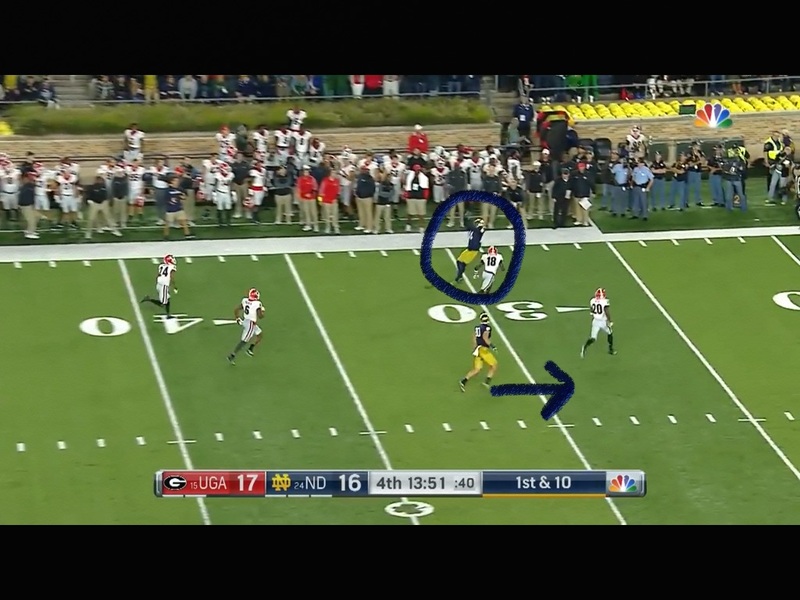 With no pressure in his face, Wimbush tries to throw this to the WR down the sideline. There’s some space there, and he ends up overthrowing it. The thing that Baker is much better at is looking for his progressions and throwing to the guy who has the best chance of making a play with it. 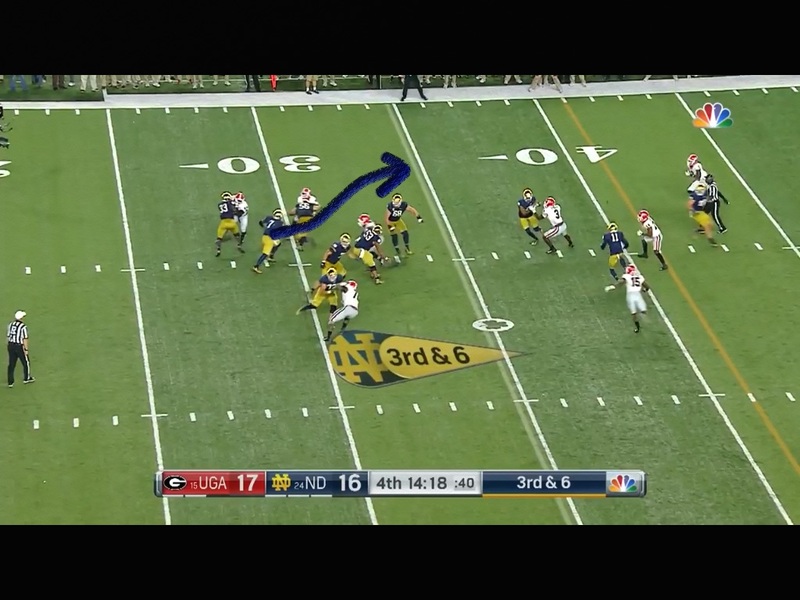 The tight end here to me is a better option as there’s no one in the middle of the field . The receivers and tight ends for the Sooners are better schooled at finding open spaces, and I think there are plays to be had on this secondary.